Brief Synopsis – The child of an astronaut born on Mars with the inability to sustain his life on Earth yearns to visit Earth and find his biological father. My Take on it – I saw the trailer for this film a few months back and was quite intrigued to see where things would be taken. The premise itself is quite interesting and theuy are able to handle it almost the entirewa y through since it dips a bit about half way through. Perhaps a bit more editing would have made this feel like a tighter story. The cast is great here and I really like the chemistry between Asa Butterfield and Britt Robertson as the kids and Gary Oldman and Carla Gugino as the adults. The four of them make this film even more enjoyable to watch despite the fact that there are a few cheesy bits here and there and that some of the plot feels extremely predictable. The mix of a mild sci-fi story along with the characters being able to discover new ideas romance and adventure make this quite enjoyable to watch it all unfold. This may not be the best film ever made, but its still fun watching it all go through the motions. This film has a great soundtrack and it works really well along with the story. Bottom Line – Interesting premise that works most of the way through. Nice cast makes the story quite enjoyable to watch. Liked the mix of mild sci-fi with romance and discovery. Parts may seem a bit cheesy and predictable, but it’s still fun going thorugh the motions. Recommended! You make it sound good. The reviewers out there are generally trashing it. 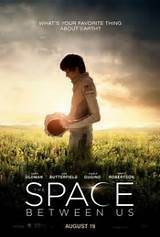 ie; RT https://www.rottentomatoes.com/m/the_space_between_us/ Just goes to show, they aren’t the hope all end all. You have me interested in seeing it Rob.